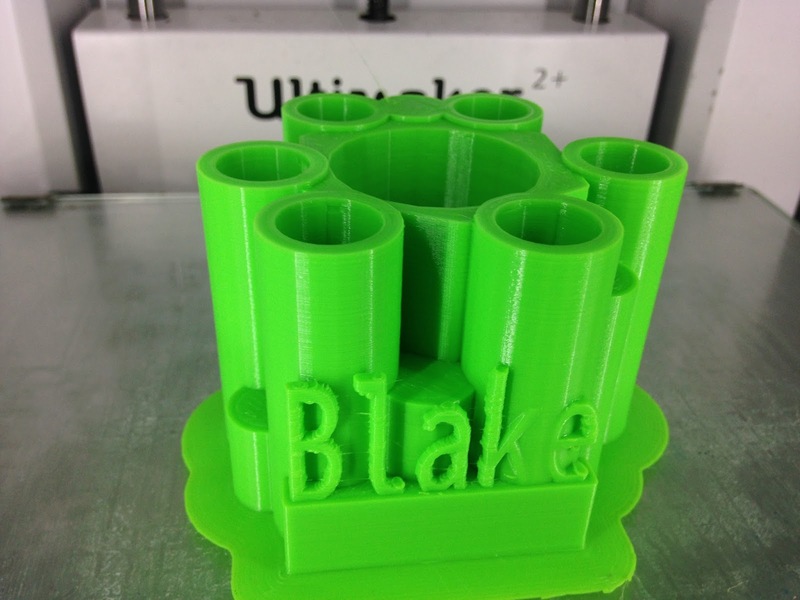 Challenge: Looking to engage a Y2 student in a project it was decided to use 3D Printing to involve him in the creative process. 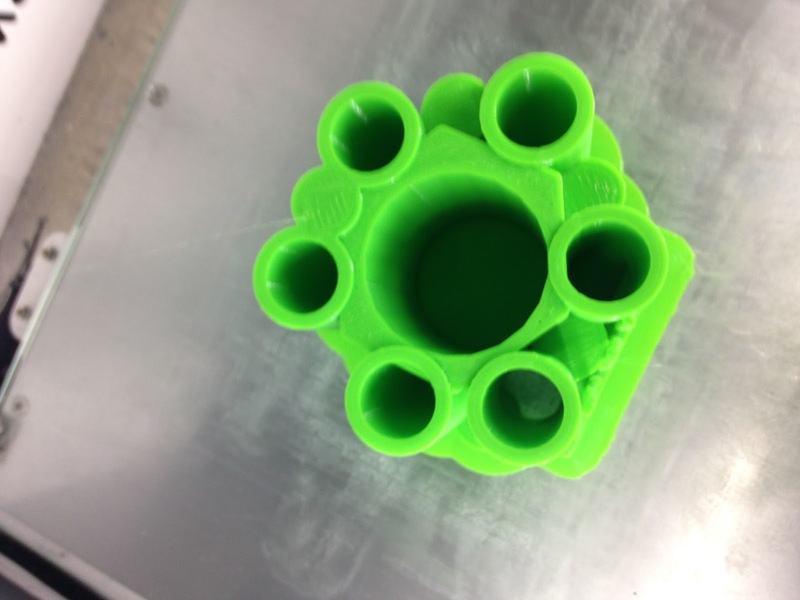 The student was able to select the image for his 3D Print which was then converted with the intention of it becoming a cookie cutter. 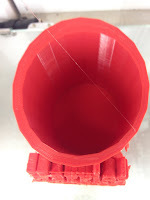 Background: The process that was used for the project came from this site, with the steps described under the 'beginners guide to 3D Printing'. Level of Difficulty: Low - the student was six years old, so the conversion of the SVG file for its import into Tinkercad was conducted by an adult as it was felt that the student would not be able to do so independently. (It should be pointed out that he was not given the opportunity and probably could have done so with instruction). 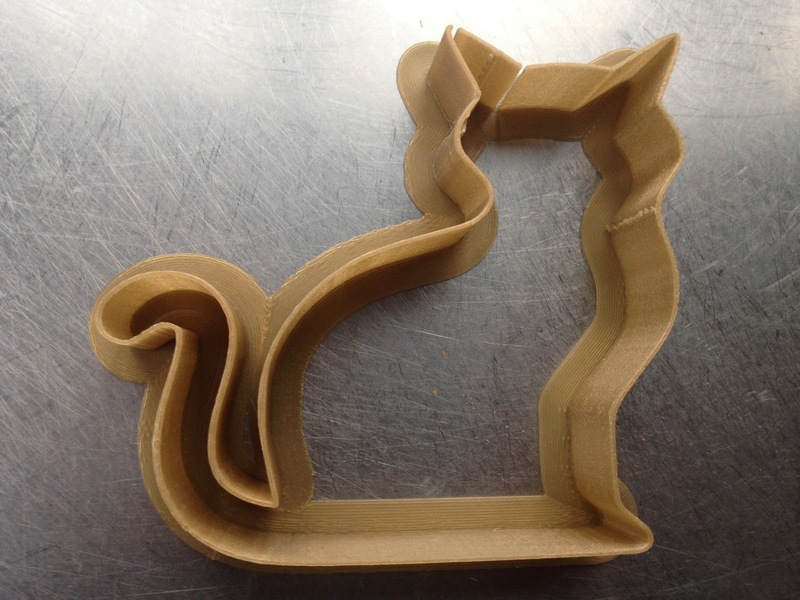 If you look closely at the design you can see the top left hand ear of the cat is in fact slightly seperated, ideally the original design would have a slightly thicker outline to allow for a thicker print. Size: Strictly speaking for a cookie cutter this is quite a big design being 10cm across and 20cm high. Timeframe: Four Hours - again as has been repeatedly stated we are now using a 8mm nozzle. Process: An image on a google search, converted into a SVG file for an import into Tinkercad. This was then stretched from its original flat design into a shape that would allow it to be used as a cookie cutter. What we would do differently: The rafting was delibrately left on this print to help with the pressing of the print into the cookie dough. As noted the width of the design ideally would have been slightly greater width of it to make the design more robust, however the creator was extremely pleased with it, including as a reason the fact he could make really big cookies from it. 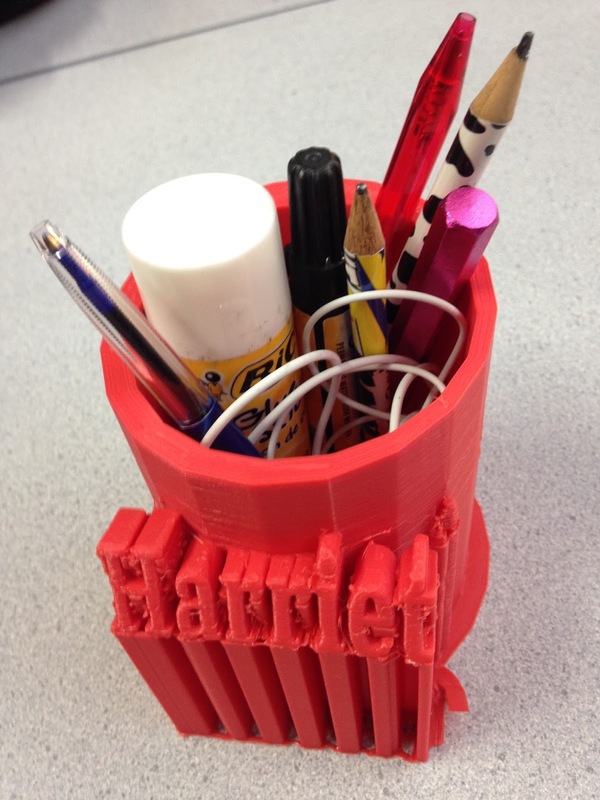 Challenge - previously on this site we have detailed the design and creation of various desk organisers for students to use to keep their stationary. These have been individualised by the students and we were looking at an eight hour or so print time. 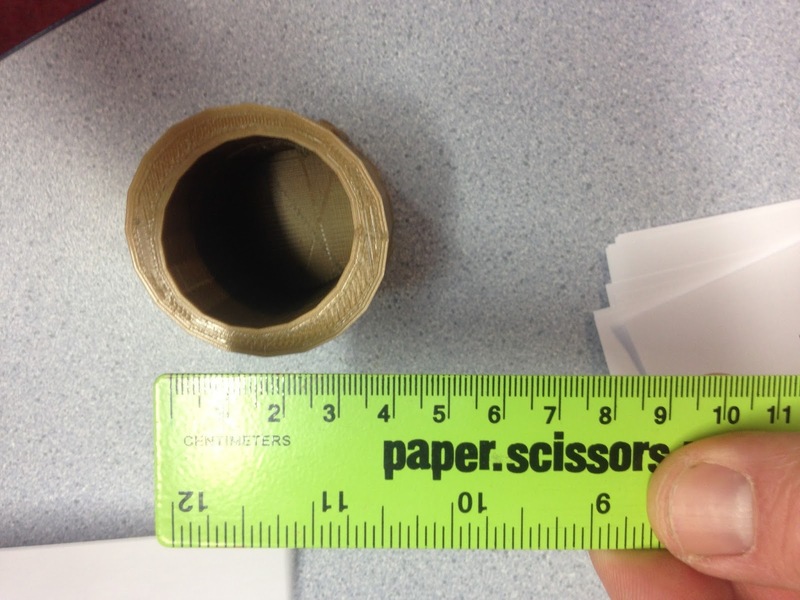 We also decided to encourage the students to look at producing smaller versions. This item came out of this process. Background: Student based her design on similar designs from other students in the classroom. 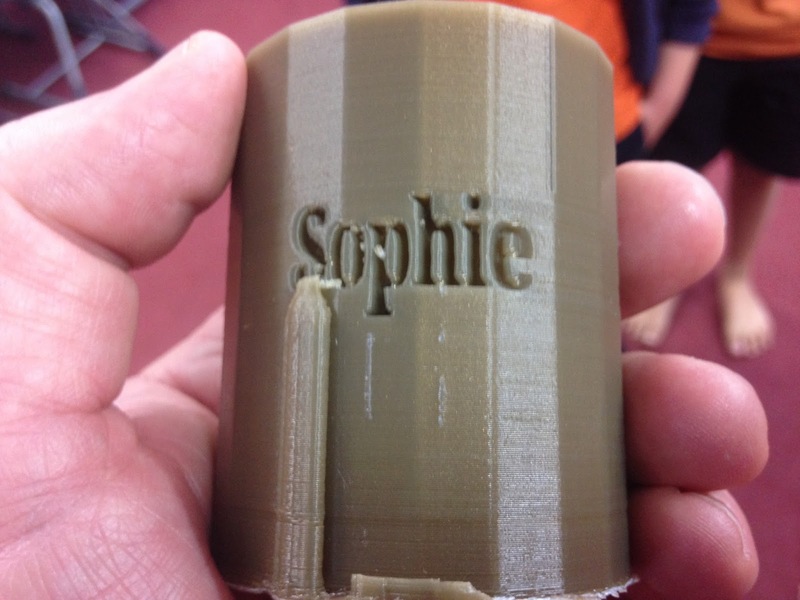 She focussed on individualising it by having her name sunken into the base of the object. Level of Difficulty: Medium the student letter and font was made as part of the shape and the shape itself was oval. Not all the letters were able to be sunken to the same depth due to the design. Size: The student organiser was 10cm heigh with a base of 6cm across. Timeframe: Four hours - this was halving the time for the larger pieces. Process: Student was producing her first next design using Tinkercad following a name plate. She was clearly influenced by this design in the series, however the size aspect of it made it unique. What we would do differently: The students object was limited by what it was able to hold as a result of its size. The lettering worked extremely well and the student was able to produce this independently. As a consequence she was thrilled with the design and able to produce an object that she was proud of. Above - Box and lid together - prior to removal of the 'rafting'. 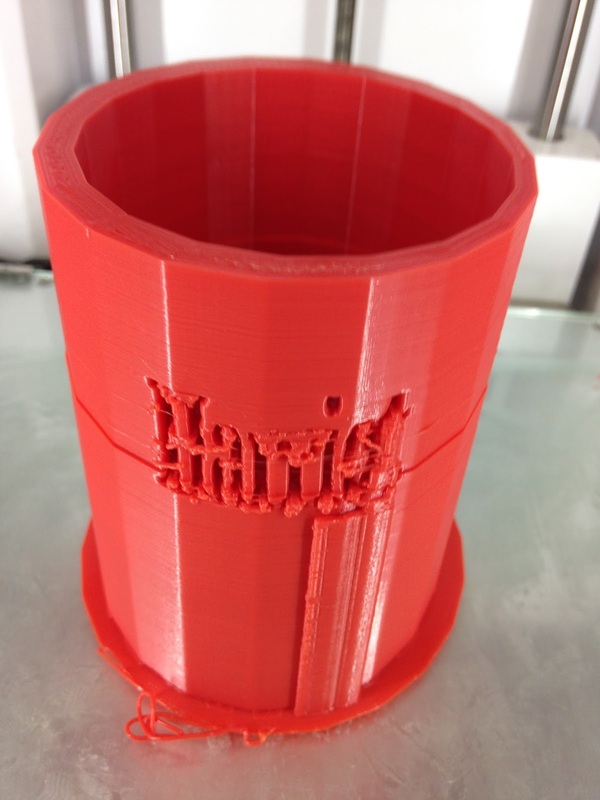 Challenge - Student who had previously completed the expected introductory tasks was looking to move towards creating more creative and technically difficult print. 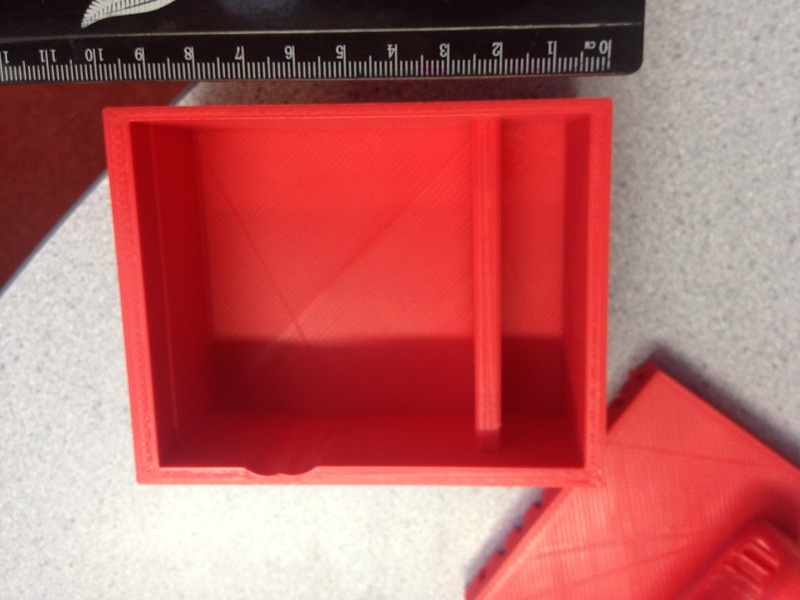 He identified that he had an iPod that currently sat on his desk at home when not at use and decided to print a box to use for storage. Background: Student created the original idea from scratch and as a consequence designed it, measured it and throught about the process and the end product. Level of Difficulty: Medium. This was created by a nine year old student however it required a number of compartments and details that required specific measuring and designing. It was a completely original design from start to finish including a 'drop in lid' and cosiderable rafting which needed to be removed in stages. The lid and the box were printed separately due to their size. There was inspiration from this box. Size: the base was 15cm wide, 10cm across with a depth of 5cm. The lid was essentially slightly smaller than this so it could drop down into the base. Timeframe: Due to its size being slightly smaller than the Ultimaker 2 build plate both major pieces were printed separately. The lid was printed in an six and a half hour print. The box was more detailed and required ten hours. Process: Inspiration came from another student in the classroom with thier 'Mothers Box Design'. There were elements of that design in this, such as the drop in lid. The student has previously used Tinkercad to produce basic classroom designs and was looking to stretch himself with a more complex design that would also have a practical use. What would we do differently: There was not a a signature/name built as part of the design which is something that could have been included. The student spoke afterwards and it was suggested that there could have been an insert designed into the box that would have allowed a charger cord to have been plugged directly into the box or a dock option to hold it. The student himself was extremely pleased with the project and the execution of it. 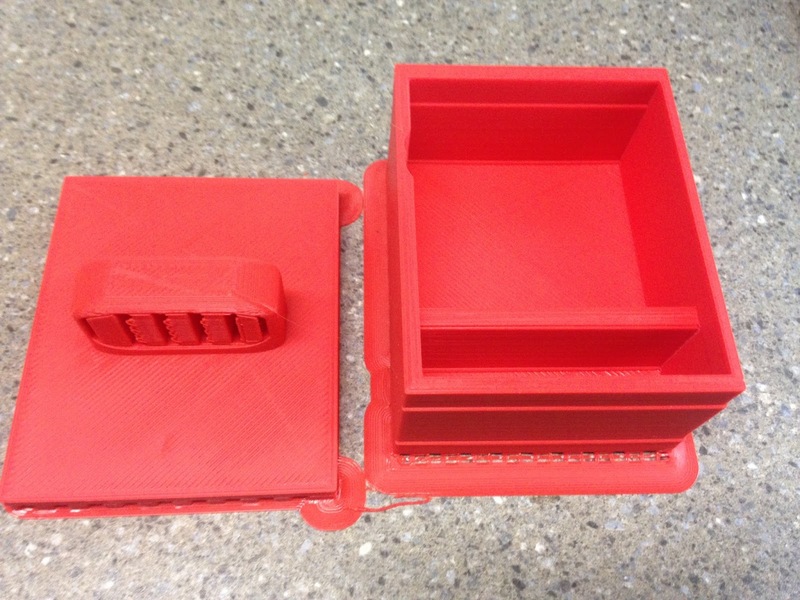 Challenge: This student was looking to expand his use of 3D Printer by creating something that was original and also had a practical use for him in the classroom. The student in this case was a Y6 student who was 11 years old. Background: Student was inspired by similar prints from other students in this series. He was looking to ensure that the print was original and had his own spin on previous designs. He adapted the singular approach of previous desk organizer to include a central cylinder and six additional smaller cylinders for the holding of stationary. Level of Difficulty: Medium - a basic design in this series has seen a singular cyclinder model, this design improved on the basic design by incorperating additional storage as seen in the pictures. Size: 15cm by 15cm with a height of 10cm. The typical prints in this series by the students have featured a greater height however the student felt this design suited the purpose. Timeframe: Nine hours (8mm nozzle) with a regular print structure. Process: Designed in Tinkercad, with the basic shapes created using the main default design tools. The design was then imported into Cura, the design and processing program for 3D Printing on an Ultimaker 2+ and then printed. What we would do differently: The concept was an improvement on other prints in the series with the adding of additional seperate storage areas for a desk organiser. Most of the previous designs had included the name of the creator sunk into the design as an insert, this design featured a 'block' at the front that included the students name. Left: This is the second version of the print previously detailed. The identified issue was the lettering for the students name. In the original design the lettering was externally placed on the desk organiser. This didn't suit the print as the rafting and the printing produced an affect of having the lettering sitting out as a rectangular block. As a soultion the lettering was sunk into the design, as shown on the left. In this second version of the same print the named letter has been sunk into the base of the design. The dimensions of the print have remained the same, the time frame has been reduced by an hour (reducing the total time for the print to eight hours). All other details for this print remain similar to the original design and information. 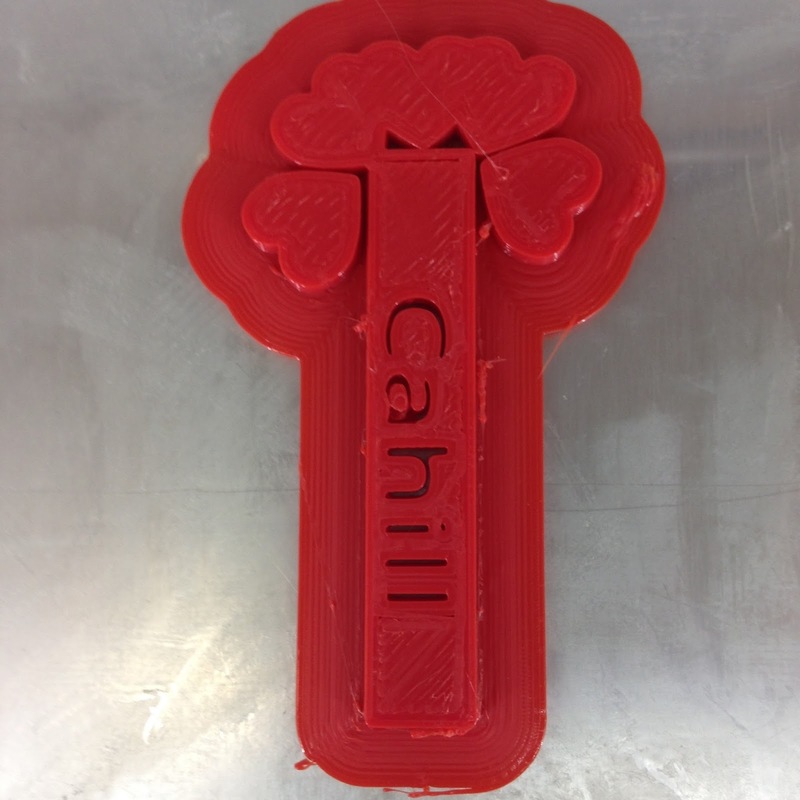 Challenge: As part of the Chapter Chat New Zealand program the students had to design an original 3D Printed Bookmark for use. The students were Y3/4 students who were designing for the first time - using Tinkercad. Background: Students were mentored in their use of Tinkercad, the students doing the tutoring were Y6/7 students from another room at the School who had experience in 3D Design and 3D Printing. This task has been completed with previous prints on this site on two previous occassions. Level of Difficulty: Low: Students were producing work for the first time using the default setting and were able to produce this work with minimal assistance. Above: 'Taylah' Bookmark shown to scale. Size: Varied - the prints in this sequence were designed to work as a bookmark for a regular childrens chapter book hence a size of 15cm to 10cm and then 5cm across at the top. The Cahill bookmark had a width of 5mm. The Taylah print was 1cm thick and a little too bulky for its purpose. 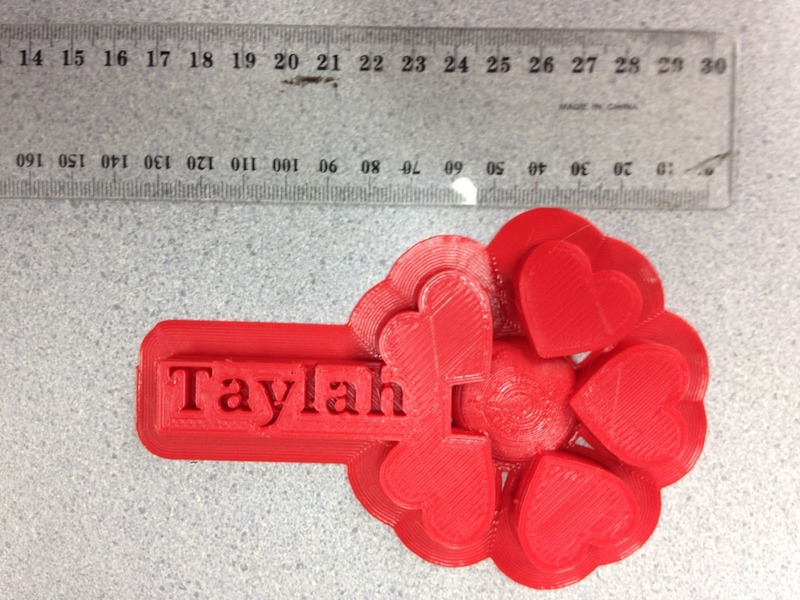 Timeframe: The Cahill Print was 45 minutes (8mm nozzle) and the Taylah Print two hours. Process: The students were shown the process of design and creation with Tinkercad and given a brief of a bookmark. Otherwise they were able to work to create original designs of their choice. They were able to share ideas hence the similarities between designs. Nothing. In this case the prints were impressive for first designs and the students were thrilled with the results - the practicality of the designs meant that they didn't perfectly fit the purpose as they were a little buky, and would have benefitted from having a clip or an insert to allow the bookmark to fully serve its purpose. 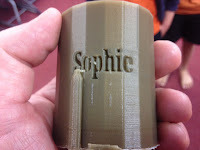 Challenge: For student to graduate from producing an original name plate/badge to produce something more challenging and 'next level' using the schools 3D Printer. 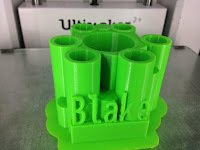 Background: This is the students second print, using Tinkercad as a design project. The student was assisted by other students who had produced work from the classroom and was looking to refine her design to produce an object that was useable and achieved the purpose of creating a pencil desk organiser. Level of Difficulty - This was medium - the issue was the lettering/font that went with the shape. The basic design was a default design from Tinkercad from the main interface. Once the shape had been measured and identified the only issue was the stretching of of the shape. Size: 8cmx10cm with a height of 10cm. Timeframe: Nine Hours on a regular print setting with a 8mm nozzle. Issues: With the base of the design none. With the lettering of the students name - plenty. In the original Tinkercad design the lettering wrapped seamlessly around the shape and was attatched with rafting to the design. The practicality was the lettering didn't work in this format - so an alternative plan was devised with the letters being sunk into the design for the reprint. This design was carried out by the student who had worked successfully to do so to insert his name into the 'gift box' post. The original design was left with the rafting still attatched (see photo) to ensure the lettering and the students name remained in place. 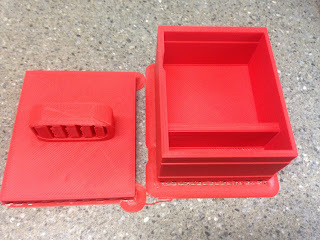 Process: As with nearly everything else on site the student used Tinkercad which was then converted into a Cura 2.6 file, and then printed on regular settings with an Ultimaker 2+ Printer. 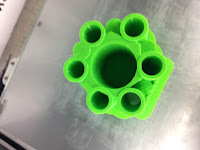 (as noted on previous posts the previous nozzle was 4mm and we are now printing on a regular basis with a 8mm nozzle which is having a considerable and positive influence on the print times of the projects the students are working on. What we would do differently: The student was extremely pleased with the print so much so she insisted on using the object even though it hadn't met the design brief. The student has every intention of repeating the process, this time with the lettering embedded into the print.